A reader speaks of a one flow that we are supposed to tap into which is beyond dualities and time and space, yet the very fact that you call it a flow indicates otherwise. If it “flows” then it moves. If it moves then it is not unchangeable, for to flow or move it would have to move from point A to point B. 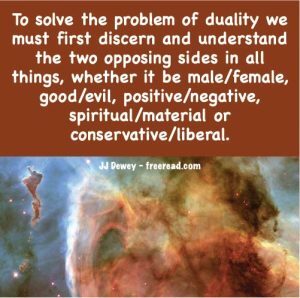 Because we have a point A and a point B dualities are created. How can you say this flow is beyond duality when there would have to be a duality (points A & B) to even have a flow? Points A and B would have to be separated by space and if there is space and movement then there is time. Time is not created by consciousness for time passes even when we are unconscious. Instead time is registered by consciousness. Time is created by motion through space. Thus any flow that does exist is created in space, time and motion, and exists in the principle of duality. If you can explain how a flow can exist with no space, time and duality and in a state of changelessness I would be interested in hearing. Phil, Richard, Moe and Curley all worked together in a government bureaucracy. All of them were pretty much settled in for life. Their positions and retirement was secure. Each payday there were no surprises, they received their pay with standard deductions taken out. There was also much routine in their jobs and everything was very predictable. The four often ate lunch together and complained about the monotony. The other three agreed and the venture was planned. “The boring office is better than this,” said Moe as he turned around and headed for his safe haven. Then Phil went ahead hoping that the two others would follow. Richard followed immediately, but Curly hesitated until Moe was out of sight, then he caught up with Phil and Richard. They hiked until sundown until they were deep into the unexplored wilderness. Curly brushed up against some type of poison ivy and began to complain. Phil sensed he was having second thoughts about the excursion, but continued leading into seemingly more dangerous territory. By the time they pitched their tents they had heard the cry of many wild animals that did not sound friendly. That evening in the pitch black night a grizzly bear came into the camp and poked his head into Curly’s tent. Curly ran out the back as fast as he could go. Phil and Richard saw him run into the night and that was the last they saw of him. No one ever did find out what happened to him. The bear next came after Phil and Richard, but they grabbed flaming sticks from the fire and together they were able to cause the bear to retreat into the forest. “That was close,” said Phil. “I guess this does seem like a crazy idea to you by now,” he said looking for Richard’s response. “So you want to go back then?” said Phil. The two men continued on their quest and it was even more difficult than they supposed. They had to cross a raging river and Richard for a time was lost in the current, but Phil who was a strong swimmer managed to save him. Another time Phil ate a poisonous berry, but Richard who had a knowledge of wild herbs made him a tea that saved his life and carried him upon his own back when again pursued by another bear. A second bear incident occurred on the fourth day and it caused them to lose their compass and most of their gear and provisions. For many days they wandered through many dead ends trying to find their way back home. Now they had no tents they had to make makeshift huts for shelter and live off natural berries. They also made a hook and caught a few fish and set some traps for wildlife. Many times in their attempt to get out of the wilderness so they could return home they had to retrace their steps and start again, then move backward and plan again. Finally after being in the wilderness for almost 40 days Richard remembered he had a sewing needle in a pouch that had some magnetism in it and they were able to determine the true North by floating the needle on still water. Once they found their true direction they were able to return home in just a couple days. Moe was upset by this, but after much thought he gathered the courage together to tackle the wilderness again with a few good friends. Phil and Richard ventured on to risk and danger on another level. Because they did not know much about business in the real world they lost everything they had three different times, but on the fourth attempt they succeeded and their joy was full. Comment: the boring office represents the state of just “being.” The journey into the wilderness represents the process of Becoming. Question: Why does the process of Becoming and creating our own changing reality take us o a higher level of enjoyment than just staying in the safe place away from the dualities?